Converting MOV to AVI on Mac…ugh. A client needs or wants AVI files because he's using Nero Movie Editor on a PC. I've asked him to check if that program uses .mov files considering I captured the tapes into FCP (figured I could just grab the transferred files and convert them). I did try MPEG streamclip and FFmpeg, but both created avi files that can't be read. I used QuickTime to convert MOV to AVI on Mac but QuickTime said the file was corrupt. There will be a time when you need to convert MOV to AVI on Mac as MOV is not compatible with Android mobile devices and Windows-based programs like Windows Media Player, Windows Movie Maker etc. This guide will show you how to convert MOV to AVI on macOS (macOS Sierra/El Capitan) with lightning-quick speed, together with good file size and quality. 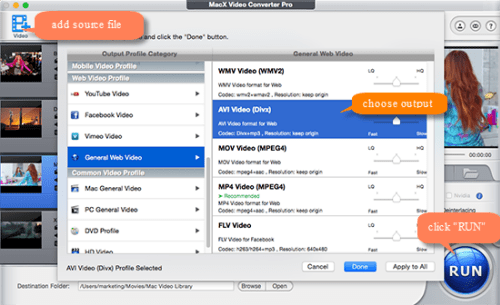 MacX Video Converter Pro is an easy to use MOV to AVI video converter for macOS that supports the fastest MOV to AVI conversion, up to 5x faster speed than online free Mac MOV to AVI converters or open source free video converters for Mac like Handbrake, FFmpeg deliver. The secret lies in the HT, Intel QSV tech, and Multi-core CPU processing. With built-in High-quality Engine, the tool promises nearly zero quality loss during the MOV to AVI conversion on MacBook Air/Pro/iMac. Plus, it can suit your needs if you require smaller file size as the MOV to AVI Mac converter can compress MOV files before conversion. Follow the guide below to get started and to dig out more stunning features from the top-ranking MOV to AVI converter for macOS. Step 1: Free download the MOV to AVI converter for macOS and run it. Click Add Video button on the top-left corner and a popping-up window will appear. Select MOV video files you plan to convert to AVI. You can add multiple MOV files at a time to convert to AVI in batch. Or simply drag and drop sources files to load. Step 2: Choose output format when Output Profile window appears. Click General Profiles or PC General Video, and select AVI Video, then click "Done". Step 3: Click "Browse" button to select a destination folder on your computer to save converted AVI files from MOV. Step 4: Click "RUN" at the bottom of the best video converter for Mac to process MOV to AVI format conversion. 1. With built-in 370+ video audio codecs, the MOV to AVI converter on Mac supports converting nearly any formats, for example, MOV to MP4, MOV to WMV, WMV to MOV, MOV to MP3, MKV to MP4, MTS/M2TS to MP4, MOV to FLV, FLV to AVI, and more. 2. Compress large MOV file size down quickly without decreasing too much quality. 3. Edit MOV video movies, like adding watermark/subtitles, trimming, cropping, adjusting video and audio bit rate, frame rate, etc. 4. Download videos from YouTube, Facebook, Vimeo, Dailymotion 300+ sites in MOV, MP4, FLV, MKV, 720P, 1080P, 4K UHD, any format and any resolution. MOV is a container format developed by Apple and mainly used by Apple QuickTime. Many programs can open MOV files, including QuickTime Player, Adobe Aftereffect, Adobe Premiere, Adobe Flash etc. MOV multimedia file type can contain multiple tracks that hold a variety of information, such as video, audio, text etc. iPhone, iPad, iPod, Apple TV, QuickTime Player and other Apple products can play MOV. To play MOV on Windows Media Player, Android Windows mobile devices, users have to convert MOV to AVI, WMV or MP4. AVI stands for Audio Video Interleave, is also a multimedia container format but developed by Windows. AVI format is widely used for short films and advertisements. Uncompressed AVI file can have very large file size. AVI is an old format and will be replaced by MP4, MKV and some other more recent container formats due to AVI format disadvantages like AVI playback errors, QT not playing AVI, AVI compatibility issues. iPhone iPad and other Apple software don't support AVI, you need to convert AVI to MP4, MOV or other formats. MacX Video Converter Pro is a top-rated MOV to AVI converter for macOS, which can convert MOV to AVI on MacBook Air/Pro/iMac etc. in batch with quick speed, high quality and good file size, thanks to HT and QSV tech and High-quality Engine.